The husband of a woman murdered on honeymoon in South Africa has returned home after being granted £250,000 bail by the High Court. Shrien Dewani, 30, was arrested on suspicion of conspiring to murder his wife Anni and South African authorities had opposed bail. The care home owner was driven back to his home in Bristol on Friday evening. Mrs Dewani, 28, was shot when the taxi she and her husband were travelling in was hijacked in Cape Town last month. Mr Dewani had been held in custody at Wandsworth Prison in south London and was released by High Court judge Mr Justice Ouseley at a hearing in the capital. His conditions of bail include electronic tagging, home curfew and having to report to the police daily. 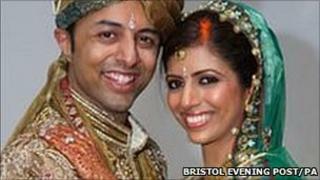 Mr Dewani, from Westbury-on-Trym, denies any involvement in the murder of his wife, who was from Sweden. He told the court that he did not consent to being extradited. His spokesman Max Clifford said his family were "very pleased" with the decision to grant bail. He said: "They're pleased also that he is able to go home and continue his trauma and bereavement counselling. He is going to be surrounded by his loved ones and his family, who will support him." Lawyers for the South African authorities argued that if Mr Dewani was permitted bail there were substantial grounds for suspecting he would not surrender for an extradition hearing. Counsel for the South African government, Ben Watson, told the hearing at the Royal Courts of Justice on Friday that "significant new evidence" against Mr Dewani had come to light. Mr Watson told the court this included new CCTV film and independent evidence that Mr Dewani had allegedly paid for the murder by using money he had acquired on the black market. Mr Justice Ouseley ruled there was "strong support" for the submission that "Dewani genuinely hopes that the investigation will clear him" and would not flee. He said: "I have concluded that he has a continuing and realistic interest in making sure that he clears his name. "He has no criminal convictions, is professionally qualified and his family is of high standing in the local community in Bristol, with no obvious interest in helping him to abscond." He said because of the "tragic and terrible murder of his wife", Mr Dewani's face was well known and it would be difficult for him to leave the UK or "go underground". Representing Mr Dewani, Clare Montgomery said a group of self-confessed robbers and murderers desperate to escape a whole life sentence had accused her client. They had "everything to gain and nothing to lose" by implicating Mr Dewani in the killing, she said. She argued there was "nothing" in new material put before the court which strengthened the case against him. The South African authorities want to question Mr Dewani after taxi driver Zola Tongo told Western Cape High Court he was offered 15,000 rand (£1,400) by Mr Dewani to kill Mrs Dewani. The couple's taxi was hijacked on 13 November in Cape Town as the pair were travelling through the Gugulethu township. Mrs Dewani's expensive wristwatch, a white-gold and diamond bracelet, her handbag and her mobile phone were stolen. Mr Dewani was released unharmed. On Tuesday, 31-year-old Tongo, from Bothasig, was sentenced to 18 years in jail for murder, kidnapping, robbery with aggravating circumstances and perverting the course of justice. Xolile Mnguni, 23, and Mziwamadoda Qwabe, 25, who are charged with murder, kidnapping and robbery with aggravating circumstances, will appear before Wynberg Regional Court on 25 February. A full trial at Western Cape High Court is due to begin at a later date. South Africa's National Prosecuting Authority said in response to Friday's High Court ruling that it would continue preparing extradition papers for Mr Dewani.